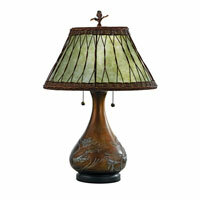 Long Description: Features a soft green mica shade with a wicker overlay, and bronzed base with an embossed pine branch motif. Q what is the body of the lamp made of? A The body of the Quoizel Lighting Mica 2 Light Table Lamp MC120T is a resin material. Q what are the dimensions of this lamp shade? 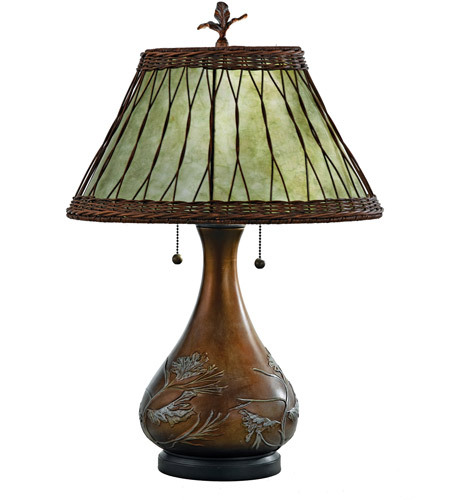 A The Quoizel Lighting Mica 2 Light Table Lamp MC120T shade dimensions are: 8.5" x 17" x 9". Q Can you descibe the finial on the shade. I cannot make out what it is. Is it metal or plastic ? Q does the lamp shade come in different hues? we have one that is brownish, new one is greenish? A The Quoizel Mica 2 Light Table Lamp MC120T is not available with different optional shades. The shade is described as a Soft Green Mica shade.